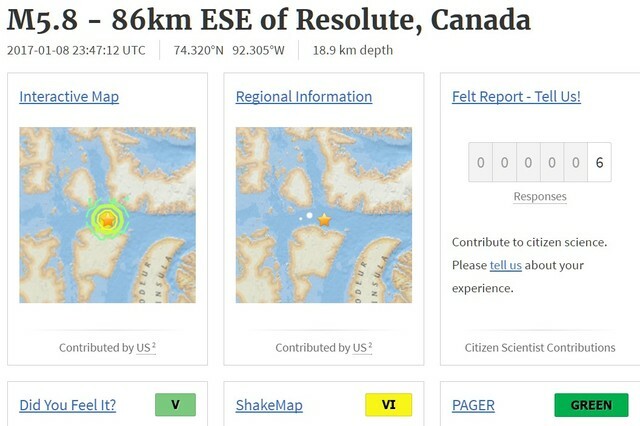 2 different stories about depth between USGS and JBM. Japanese Bureau of Meteorology said M5.6, depth about 20km. Near to Fukushima. No worries so far. just like hawthorne swarm, we are now noticing similar situation southern calif 2:25pm my time. look at the flurry of small aftershocks, zoom in and within 8 miles from el centro naval airbase.. and lots of military around...what is happening...edit to add it is brawley calif.
edit to add: "NAS Lemoore now hosts the Navy's entire west coast fighter/attack capability. NAS Lemoore was built "from the ground up" as a Master Jet Base, and has several operational advantages, and relatively few constraints, as a result." "On July 2, 2013, the California Department of Toxic Substances Control—DTSC released a draft decision on a permit modification that would allow Waste Management, Inc. to increase the capacity of the hazardous waste landfill. This modification would add about 14 landfill acres and increases the capacity by 50 percent, or approximately 5 million cubic yards. The effect of this expansion would add an estimated 4.6 billion pounds of toxic waste to the site. On May 21, 2014, the DTSC issued a final permit approving the company's planned expansion to allow an additional 5.2 million metric tons of capacity. Appeals of the permit issuance were filed by Greenaction together with People for Clean Air and Water of Kettleman City and by the Center for Race, Poverty and the Environment. On October 14, 2014, the Department of Toxic Substances Control denied both appeals." 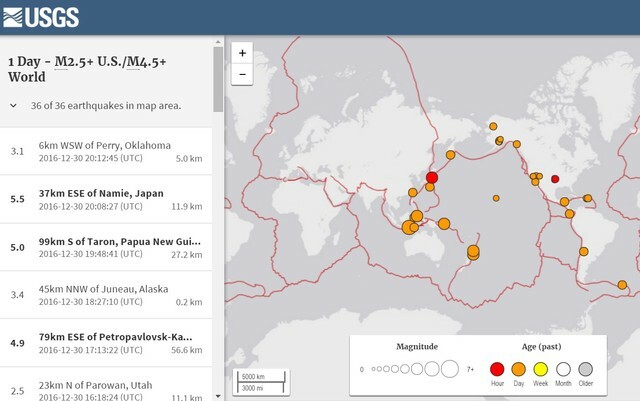 7.2 fiji almost an hr ago...suspicious0bservers ben's new app has been hitting out of the park...finally someone with earthquake prediction capability...nobel peace prize candidate ? I thought this is an aftershock at first, but then M5.1 with earlier EQ was reported by breezy. Pattern-wise, I think this was the main EQ for the region. The aftershocks to be expected, I take. A series of strong earthquakes hit central Italy on Wednesday, including the capital Rome, forcing schools to be evacuated and rail links to close, although there were no immediate reports of serious damage or injury. 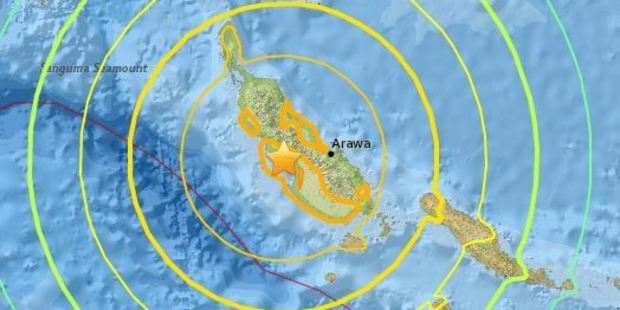 The multiple tremors, including three above magnitude five, were clustered around a region which was battered by a spate of deadly quakes last year. Buildings in Rome wobbled and the city's underground metro system was shut as a precaution. Schools across the capital were also closed. Not to derail this thread, but Rome earthquakes and H W Bush went into the hospital last night. Last I heard, he was stable though. But, lots of entity events potentially showing up, what with the possibility of the destruction of a monument in DC imminently. A MAGNITUDE 2.7 quake was felt across Adelaide early on Friday afternoon. It said the quake struck at 12.24pm and appeared to be centred at Seacombe Heights in the southern suburbs between Glen St and Bleasdale Ave.
Geoscience Australia initially estimated the depth at 20km but its website later revised that to 13km. "MANILA: A strong quake shook the southern Philippines on Friday (Feb 10), killing at least three people, toppling buildings and sending panicked residents fleeing their homes, media reports and authorities said. The 6.5-magnitude earthquake knocked out power in the city of Surigao, more than 700 kilometres southeast of the capital Manila, and an unknown number of people are believed to be trapped in rubble. At least seven people were injured by falling debris in the quake which the US Geological Survey said struck at a depth of 27km 10pm. The Philippine seismological office recorded a magnitude of 6.7 with an epicentre 14km north of Surigao. The Pacific Tsunami Warning Center said there was no tsunami threat. Three people have died, radio station DZMM reported, citing the military, but no further details were given." Regional civil defence spokeswoman April Sanchez said seven people were injured outside Surigao while an undetermined number had been hurt in the city. "They can't say how many yet because of the power outage" caused by the earthquake, she told AFP. University professor Rocks Tumadag said many people in Surigao rushed to higher ground after the quake in fear of a tsunami. He said aftershocks were still rocking the city hours after the quake." Thank you so much for the link, landdy! Usually when I felt any movement in Adelaide, the pattern of EQ usually appeared a day or two later up North somewhere, along the Ring of Fire like near Indonesia. Then that shake runs further North up along the Ring of Fire and arrive to Japan. But I feel these small rattles happening lately around SA region in Oz is.....different to those I used to feel...! And because Adelaide has been known to have crystal veins all along the area (we had a quartz mine just up the hill near by from Adelaide city) and is supposed to cop a huge EQ as it's been out of cycle over 40+ years, apparently. ), I'm curious if epizo effect is happening and electrically discharging energy without us knowing. I'm having the head ache that just doesn't go away....it's now about 6 days since it began. Though I cannot know if this is anything to do with EQs but just as these EQs in Adelaide and near regions are weird, my headache has been very weird, too. Interestingly, loads of healers are living right on top of the fault line in SA, I found out. I take they are there for good reason. Anyway, this chart is from Oz geoscience site. 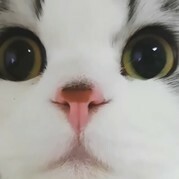 Just to add to your post. The figure shows the location of the Ventura-Pitas Point fault with respect to the cities involved. The view is of Southern California, as seen from the Pacific coast looking east. The thin white line is the coastline; the outlines of the Channel Islands can be seen off to the right (the south). The pink triangulated surface is the Ventura-Pitas Point fault. At the edge of it can be seen the stair-step cross-section, the flat part being under Santa Barbara. Credit: Gareth J. Funning and Scott T. Marshall. "A new study by a team of researchers, including one from the University of California, Riverside, found that the fault under Ventura, Calif., would likely cause stronger shaking during an earthquake and more damage than previously suspected. The Ventura-Pitas Point fault in southern California has been the focus of a lot of recent attention because it is thought to be capable of magnitude 8 earthquakes. It underlies the city of Ventura and runs offshore, and thus may be capable of generating tsunamis. Since it was identified as an active and potentially dangerous fault in the late 1980s, there has been a controversy about its location and geometry underground, with two competing models. Originally, researchers assumed the fault was planar and steeply dipping, like a sheet of plywood positioned against a house, to a depth of about 13 miles. But a more recent study, published in 2014, suggested the fault had a "ramp-flat geometry," with a flat section between two tilting sections, similar to a portion of a staircase. In a recently published paper in Geophysical Research Letters, a team of researchers used computer modeling to test the two alternatives. 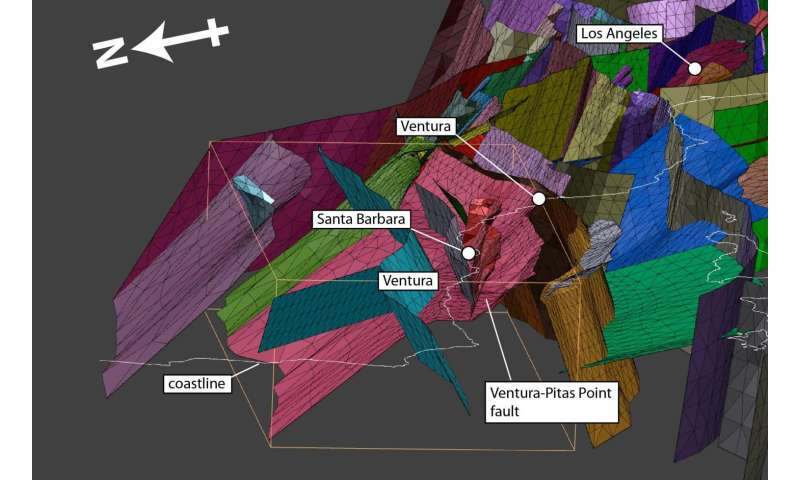 In these computer models, the crust—outermost layer of rock—in the Ventura-Santa Barbara region is represented as a three-dimensional volume, with the surfaces of the region's faults as weaknesses within it. That volume is then "squeezed" at the rate and direction that the region is being squeezed by plate tectonics. In comparisons of the expected movement in the models with GPS data, the fault with the staircase-like structure was favored. That means more of the fault, which runs westward 60 miles from the city of Ventura, through the Santa Barbara Channel, and beneath the cities of Santa Barbara and Goleta, is closer to the surface. That would likely cause stronger shaking during an earthquake and more damage. This would be on the Juan DeFuca. 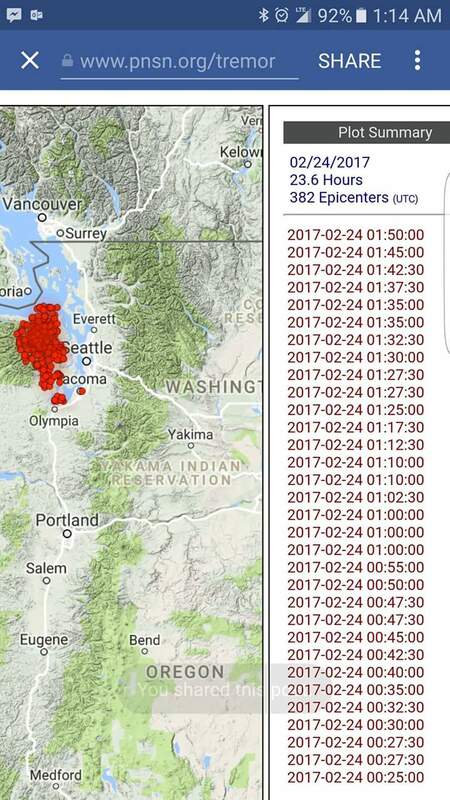 382 quakes in 23.6 hours. What they call a swarm, and most likely 1.0's or so. Not good! "Three million Americans, primarily in Oklahoma and Kansas, are at risk from human-induced earthquakes this year, the U.S. Geological Survey said Wednesday. During the fracking process, waste water is collected and later disposed of by injecting it into deep underground wells at high pressure. That water fills pores in dormant faults, causing them to slip and unleash the quakes, according to the USGS." "SEATTLE, WA — Although the risk is slight, it might be a good time to check your supply of food and fresh water. That's because the region is entering a period when the risk of a megathrust Cascadia subduction zone earthquake is slightly higher. 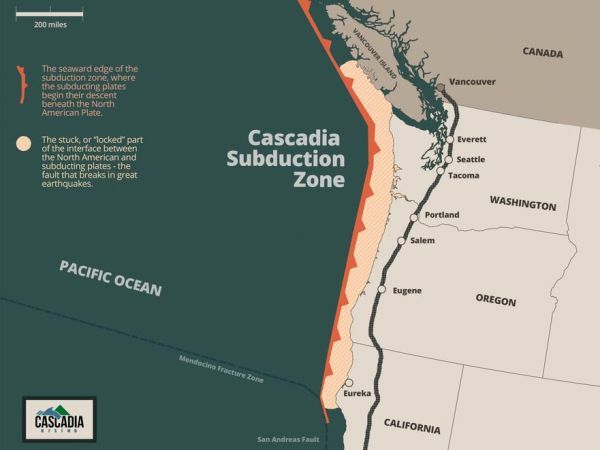 The probability of a Cascadia quake goes up during a slow-slip event, but just slightly more than during other times of the year, Steele said. Still, it's not a bad idea to check your emergency plan and make sure you're ready for a large earthquake." 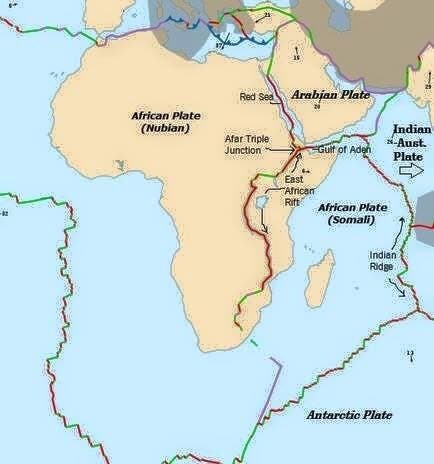 African fault line originates clear up by Israel, through the Red Sea and then S through Ethiopia, down through SA. 7.2 Earthquake Mindanao, Philippines 19 minutes ago.